What Thomas Paine did for the American Revolution with the publication of Common Sense, Marilyn Ferguson does for the transpersonal revolution with the publication of this astonishing call to internal arms. Marilyn Ferguson is one of the preeminent thinkers, gatherers, synthesizers, and interpreters of research on all the cutting-edge fields of human consciousness. The Aquarian Conspiracy, published in 1980, has sold 2.5 million copies and has been continuously in print. The book was hailed as the "handbook of the New Age," by USA Today and is widely regarded as one of the most important books of the twentieth century as the harbinger of a new segment of society stemming from the "vastly enlarged concept of human potential." Before there were Cultural Creatives and Influencers, before there were Spiriteers, before there was What the Bleep Do We Know? !, there were the Aquarian Conspirators, pioneers of social transformation. A quarter of a century later, Ferguson's original charge still resonates regardless of the "name" associated with her audience--they are still philosophically the same as those who came before. 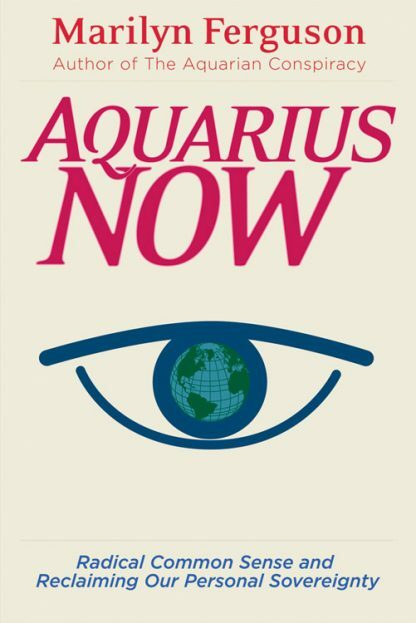 In her new book, Aquarius Now, movement pioneer Ferguson reexamines the paradigm shift to a more mindful society and finds us wanting. She sees us caught in a mindless materialism that ironically threatens our material existence. We are seduced by what she calls the Cult of Numbers, obsessed with competition, with winning and losing, afraid of anything that can't be seen or measured, and in the grip of an economic model that says only that which generates economic growth is worth pursuing. In the past, Ferguson argues, whenever things weren't going that well for any tribe or society, they literally gathered their belongings and hit the road. But it's too late for that. There's nowhere left to go. Ferguson boldly tells the truth--we have no enemy except ourselves and the mess we've made individually and collectively by refusing to get to know ourselves, to see what we're doing to our own bodies, our own minds, and to society and the Earth itself. We've refused to consider the clues in front of our faces. The imbalance we see outside ourselves only mirrors the imbalance within. The way to heal the imbalance is to heal ourselves. The way to heal ourselves is to pay attention, to witness. And then we need to reclaim our personal sovereignty. We need to take responsibility for our own actions. We need to heed the words of the myriad teachers and skills at our disposal. We need to learn to rely on our own "radical common sense." We need to create the New Age in our hearts and minds and carry it out into the world.Within that which we have chosen to ignore lie the wisdom, power, and impulse to change. The task is not to climb a mountain, but to navigate a river. We have to stop thinking of ourselves as conquerors and start thinking of ourselves as fellow travelers' with other human beings and every living being on this planet, including the planet itself. Heroism is nothing more than becoming our latent larger selves. Ferguson dares to ask the question, "Can we change?" and concludes that we can and we must change. The Age of Aquarius will occur when we want it to occur. By reclaiming the word "radical" from its current usage meaning extremist and going back to its root meaning "the essence or substance of things." By returning to the original meaning of common sense, "The consensus of all of one's senses. That power of mind which perceives truth. . . by an instantaneous, instinctive, and irresistible impulse, derived not from education nor from habit, but from nature." In the quarter century since Marilyn Ferguson's Aquarian Conspiracy defined, pulled into focus, then accelerated the transformational shift in consciousness known as the human potential movement, much has changed. Read all about it in Aquarius Now. Marilyn Ferguson published Brain/Mind Bulletin from 1975-1995. Her work not only culled the best of the new consciousness movement and put the word out, but also offered commentary and insight that helped launch a whole new way of looking at ourselves and the world we live in. She published the bestselling The Aquarian Conspiracy in 1980 (the 25th anniversary edition was published by Tarcher/Penguin in 2005). Voted the most important new age book of the 1980s, this book has remained in print continuously for a quarter of a century.